I hope you are having a good week and have been able to enjoy some brighter weather and sunshine. This next project of mine came about because of new challenges which interested me and I love putting as many of them together as I can to see what the results are. So with some guidance and creativity this is the result. 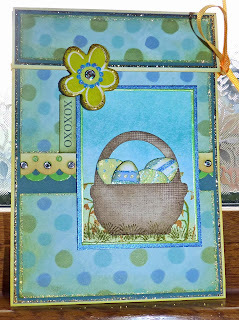 The 'Sweet Stop' sketch interested me first of all, as did the add inspired challenge at '365 cards', little baskets of eggs in blues and greens (see picture below). 'Paper Sundaes' ninth challenge is to create a multi-fold Spring or Easter card and 'Just us Girls' is to make a flap card. 'Practical Scrappers' challenge is to include chipboard and all of this also links with 'Pollycraft Monday Challenge' which is to see sparkly things, 'Secret Crafter Saturday Challenge' is anything goes and at 'Sophisti-cat' it is new beginnings. I have used my favourite techniques of distressing and edging with Stickles and Sakura glitter pens, but I started by cutting the basket and eggs from the Doodlecharms cartridge on the Cricut. I printed over the basket and used the distress inks mounting it on card which I had brayered with coloured inks and printed with flowers and grass. 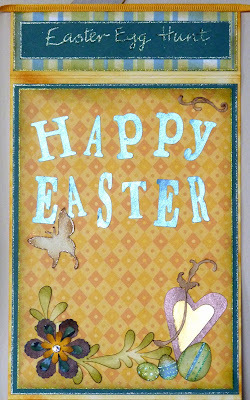 I used patterned papers for the eggs and added designs using the glitter pens. I punched two strips using a MS border punch and added gem stickers. The flower is chipboard from a K&Co collection. The ribbon has been stuck under the flap and tied behind and to the side to keep the flap closed. Inside, I used the same colour theme but a patterned background paper and I searched the internet for a free vintage image. I cut the Happy Easter letters using the Jasmine cricut cartridge and decorated more eggs and added the flowers, hearts and flourishes. On the flap I added the Easter Egg Hunt to link in with it. 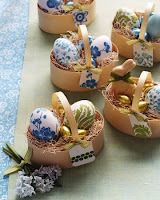 I also added Sepia Accents to the baskets and bunny ears to highlight them. The colours are spring like and the eggs suggest new beginnings, so all in all a card that meets the criteria of all the challenges. 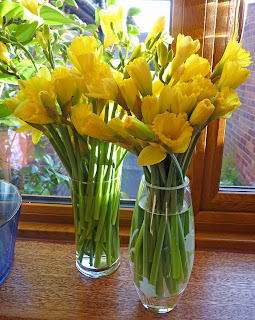 Enjoy the rest of the week and here is a photo of the beautiful spring daffodils that I came down to on Sunday morning (Mother's Day) given to me by my lovely hubby Ken. The kids also gave me chocs, wine and money, and I bought the Tim Holtz scissors with it. Great eh? It will soon be the weekend. Have fun. This is beautiful - what a lovely color combo - those daffodils made me smile out loud! Thanks for playing along with Just Us Girls. We're happy you could participate. What a lovely flap fold card Brenda! I like the soft color palette of mostly blues & greens! Thanks for playing along with Just Us Girls technique challenge - hope you come join the fun on Saturday! looks great and those baskets are fabulous! thanks for doing the cuttlebug challenge! Love the vintage, naturally! Very nice job with the 365 Cards ad challenge! Such a wonderful card - so much great detail! Great job of combining challenges too! Thanks for playing along at Paper Sundaes! This is just wonderful, Brenda!! Love both the inside and out!! Lovely card! I cannot believe you got all of those challenges into one pretty flap card! Thanks so much for playing our JUGs challenge! Great job combining challenges! I really like the colours here :-) I'm glad you joined us with this weeks Paper Sundaes challenge. Gorgeous Cards. Thanks for playing with us at The Sweet Stop! wow these are just gorgeous! Love each creation! Thanks for joining us at Paper Sundaes! Thanks for joining us this week at the Secret Crafter, I hope you come back and see us again soon. Good luck in the draw. Oooooh, lovely creations! Thank you for playing along with The Sweet Stop! I hope you will join us again! Your card is absolutely wonderful! What a great way to share your Easter photos with grandparents if you wanted! lol Thanks for joining us at Sophisti-cat this week. Nice works! And the flowers are beautiful! Thanks for joining us at Crafty Creations challenge.